Introduction: On a daily basis, dermasurgeons are faced with different kinds of wounds that have to be closed. With a plethora of skin closure materials currently available, choosing a solution that combines excellent and rapid cosmetic results with practicality and cost-effectiveness can be difficult, if not tricky. Objectives: We aimed to review the available skin closure materials over the past 20 years and the scientific claims behind their effectiveness in repairing various kinds of wounds. Materials and Methods: The two authors independently searched and scrutinised the literature. The search was performed electronically using Pub Med, the Cochrane Database, Google Scholar and Ovid as search engines to find articles concerning skin closure materials written since 1990. Conclusion: Many factors are involved in the choice of skin closure material, including the type and place of the wound, available materials, physician expertise and preferences, and patient age and health. 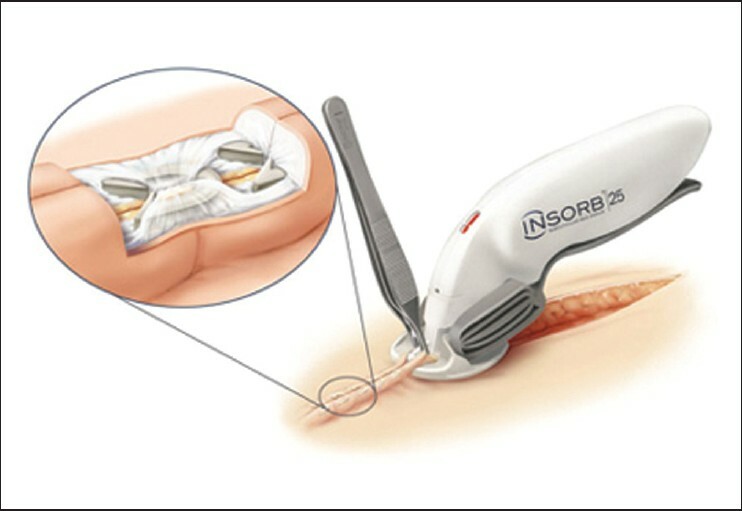 Evidence-based main uses of different skin closure materials are provided to help surgeons choose the appropriate material for different wounds. Background: Q-switched neodymium-yttrium aluminium-garnet (Q switched Nd-Yag) laser has been used in the treatment of nevus of Ota in all skin types with variable success rate. Data with an objective assessment parameter to this laser treatment is lacking. Objective: To evaluate the utility of melanin index in assessing the treatment response and also determine the efficacy and safety of the Q-switched Nd-Yag laser (1064-nm) in the treatment of nevus of Ota in Fitzpatrick skin types IV and V. Materials and Methods: A total of 35 patients treated with Nd-Yag laser were studied. The objective improvement (pigment clearance) was determined by melanin index from two fixed points: A1, 2 cm below the pupil at the mid pupillary line (when the gaze is fixed); A2, the most prominent part of zygoma. The melanin index in these two areas was recorded as M1 and M2, respectively. The subjective clinical improvement was determined by the physician and the patient global assessment score. Results: The mean baseline melanin indices M1 and M2 were 59.54 ± 9.72 and 59.02 ± 9.16, respectively. At the last visit the mean M1 and M2 decreased to 53.8 ± 8.55 (P < 0.001) and 54.13 ± 6.01 (P < 0.001), respectively. Patient and the physician global assessment score showed that 26 (74.3%) and 20 (57.14%) patients, respectively, had >50% pigment clearance. Conclusion: The melanin index, a simple non-invasive parameter is useful in assessing the treatment response more objectively. The 1064-nm Q-switched Nd-Yag laser offers good improvement in patients with nevus of Ota in darker skin types IV/V. Background: Glomus tumours are rare vascular tumours arising subungually in fingernails. Surgical excision provides histopathologic diagnosis and rapid resolution of symptoms. Objective: Present study was aimed at delineating common presentations and long-term treatment outcome of this rare subungual tumour. Patients and Methods: The clinical features and imaging results for 10 patients with subungual glomus tumours were recorded. All were treated with transungual excision. Per-operative findings and, treatment outcomes were recorded and analysed. Results: Females outnumbered males with average age being 33.3 ± 7.55 years. Presenting symptoms were severe pain (100%); nail-plate discoloration and onycholysis. X-ray was normal in 70%, though a magnetic resonance imaging done for five, helped visualise the lesion in three patients. 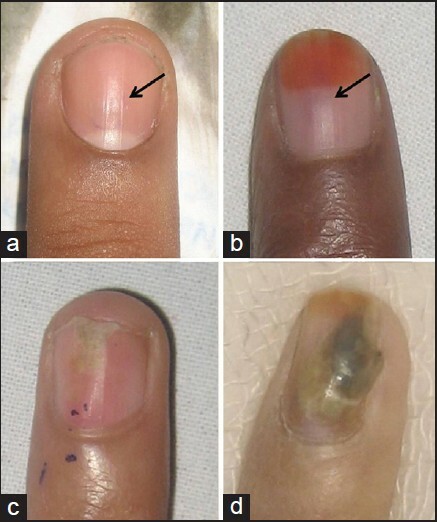 The tumour involved nail bed in five cases and matrix in five, with an average size being 6.1 ± 2.13 mm (range 3-11 mm). An average follow-up of 16.8 months (range 8-24 months) was largely uneventful with longitudinal ridging in two cases and recurrence in two (both attributed to a sister lesion). Conclusion: Subungual glomus tumours have characteristic clinical presentation. Imaging is helpful pre-operatively but has a low success rate. Transungual surgical excision is safe and effective, allowing better visualisation, easy exploration and minimal long-term complications. Background: Acne is a self limiting condition that often results in scarring and disfigurement disproportionate to its clinical severity. Isotretinoin is considered the gold standard in the medical management of severe form of acne vulgaris. Salicyclic acid (SA) peels, a β- hydroxy acid peel has got sebosuppressive effect and helps in faster resolution of acne with minimal scarring. It also decreases the post inflammatory hyperpigmentation. Combining both the modalities is usually not advocated because of expected excessive dryness and irritation Aims: To compare the efficacy of oral isotretinoin and oral isotretinoin with 20% SA peels in patients with moderate to severe acne. Materials and Methods: 60 consecutive patients with moderate to severe facial acne attending the skin department were randomized in to 2 groups. 1 st group received 20mg oral isotretinoin once daily for 16 weeks and 2nd group received 20mg oral isotretinoin once daily along with 20% SA peels every two weeks for 16 weeks. Baseline grading of acne was done with Michelsons Acne severity index (MASI).Right and left sides of the face were scored separately and total score was taken. Severity score was assessed monthly .Clinical photographs were obtained for evaluation every month. Patients were asked to follow up once every 2 weeks or earlier in case of any adverse events. Results: Patients in both the groups revealed a reduction in the number of lesions. 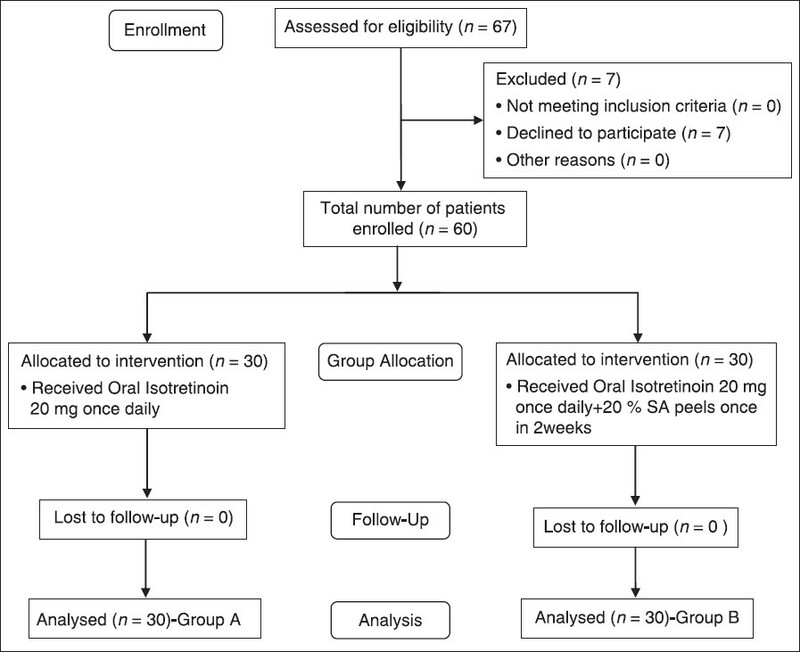 The 1 st group showed a reduction of approximately 73.4% after receiving 20mg oral isotretinoin for 16 weeks. The 2 nd group showed a reduction of approximately 92.5 % after receiving 20mg oral isotretinoin along with 20% SA peel once every 2 weeks for 16 weeks. Conclusion: Both oral isotretinoin and combination of oral isotretinoin with 20% SA peels once every 2 weeks are effective in treating moderate to severe acne but the combination showed significantly better clearance of acne than monotherapy with isotretinoin. Background: The advent of follicular unit transplantation (FUT) has given a natural appearance in the recipient area in the past two decades, but has left behind an unsightly scar in the donor area. A study of donor area and techniques to make it cosmetically acceptable is lacking. 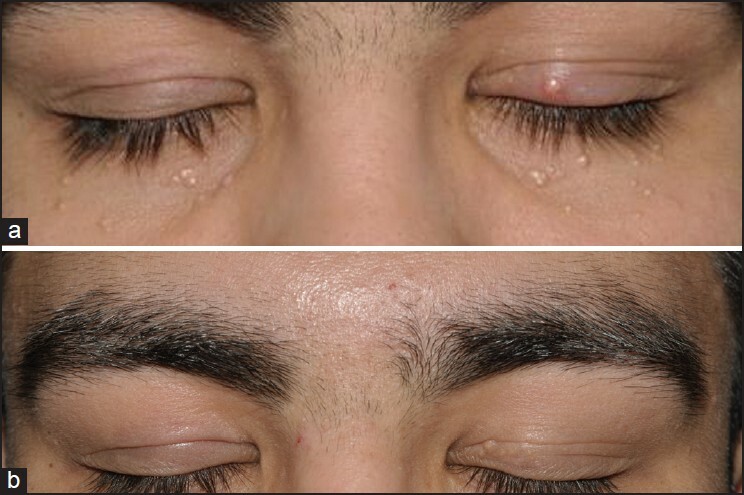 Aim: The aim of this study was to evaluate the donor area after follicular unit hair transplantation and to show a few techniques to make the donor scar aesthetically pleasing. Materials and Methods: The donor area was examined for scar width and patient satisfaction scores of donor area in 30 consecutive patients from March 2012 to February 2013 retrospectively after a minimum of 3 months after the procedure. Complications such as effluvium along suture line, wound infection, dehiscence, necrosis, folliculitis, keloids and wide scars were also noted. Results: Scar width increased with increase in width of the donor strip. 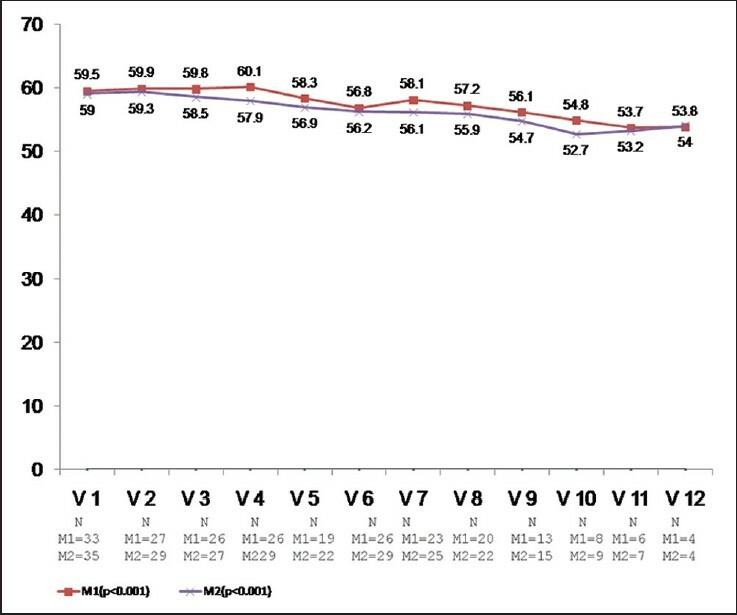 Patient satisfaction scores declined with larger strip widths. The most common complication seen was folliculitis-like lesions. Double trichophytic closure yielded the most aesthetically acceptable scar. Conclusion: FUT produces a linear scar in the donor area, which can be a significant concern in patients wishing to cut their hair short. 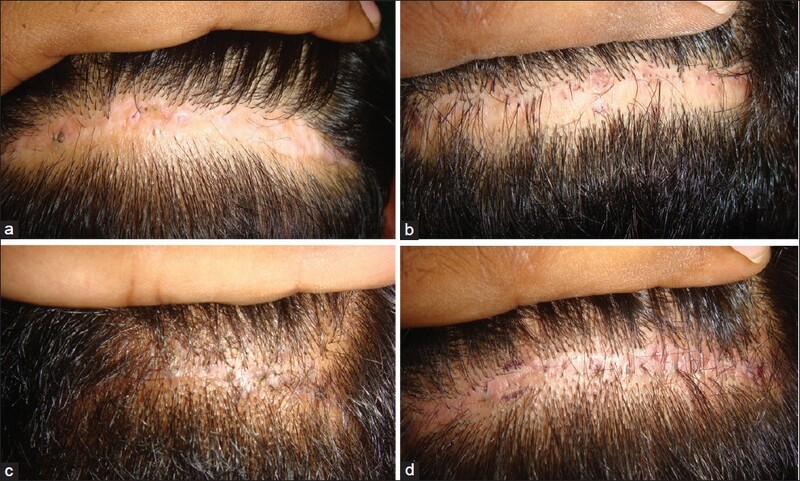 Restricting the width of the donor strip and trichophytic closure has greatly improved the appearance of the scar. 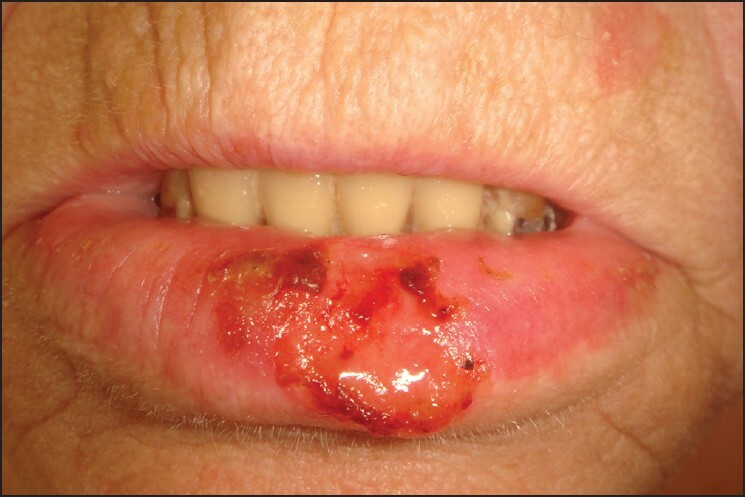 The most common cancer of the lower lip is squamous cell carcinoma (SCC). Micrographically controlled surgery (Mohs surgery) is the golden standard of therapy in localized SCC. Since the majority of lip cancer patients is >60 years of life, planning of surgery and reconstruction has to consider the age and co-morbidities. The staircase or step technique is a robust method to achieve a good functional reconstruction in a one-step procedure. We also describe a modified staircase technique when SCC is not infiltrating the orbicularis oris muscle. Introduction: The abdomen, thighs and buttocks are often the areas of greatest concern to patients following massive weight loss due to bariatric surgery. The typical appearance of the patient who has lost a massive amount of weight derives from a combination of factors, including gender-dependent body morphology and a change in body mass index, which lead to skin and soft-tissue excess and poor skin tone. Thigh laxity and redundancy represents a great challenge to both patients and surgeons. Not only because of the difficulty to satisfy the patients, but also due to the higher incidence of complications especially, with those obese patients who have not undergone bariatric surgery before. The problems with such patients are due to the heavy thighs that require both debulking and tight anchorage to prevent scar migration or labial distortion. Aim of the Work: The aim of the present study is to improve the aesthetic outcome and avoid the complications of medial thigh lifting with simultaneous liposuction in obese and non-obese. Patients and Methods: A total of 25 female patients presented during the period from January 2007 to July 2011 complaining of moderate to severe thigh laxity with or without lipodystrophy. In 20 patients medial transverse thigh lift was performed, to treat medial thigh friction and laxity particularly in the upper half. Whereas, in the other five patients were suffering from upper and lower medial thigh bulkiness, vertical thigh lift was performed. Results: All patients recovered well in 2 weeks and showed improvement of thigh contour. Scar downward displacement in one patient. No skin necrosis or seroma. 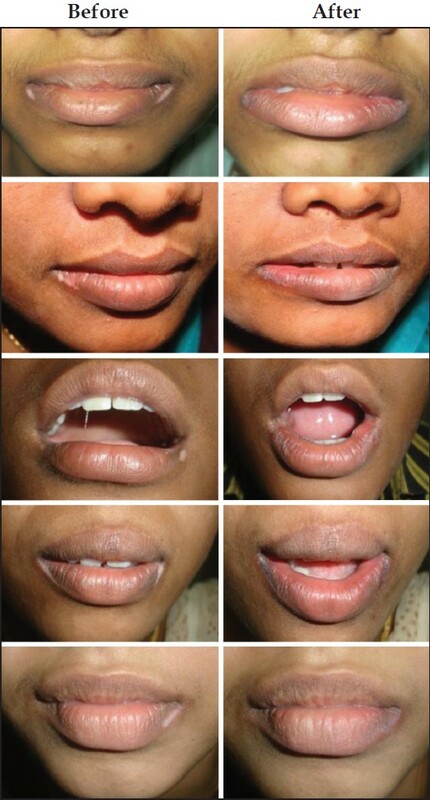 No labial distortion or separation encountered. 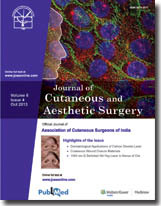 Conclusion: Simultaneous liposuction and thigh lift gave good results provided proper patients selection, appropriate technique to each patient, meticulous, cautious liposuction and handling of the tissues and most importantly is the deep tight anchorage sutures to guard against the effect of heavy skin flaps. 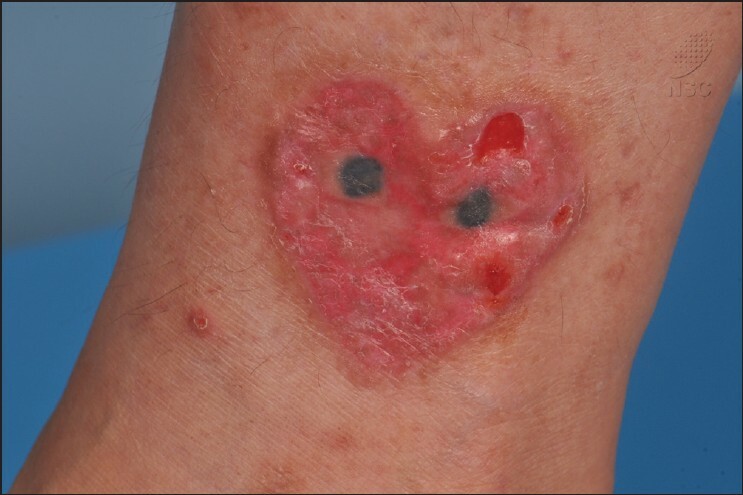 Decorative tattooing has been linked with a range of complications, with pseudolymphoma being unusual and challenging to manage. We report a case of tattoo-induced pseudolymphoma, who failed treatment with potent topical and intralesional steroids. She responded well to sequential treatment with ablative fractional resurfacing (AFR) followed by Q-Switched (QS) Nd:YAG 532 nm laser. Interestingly, we managed to document the clearance of her tattoo pigments after laser treatments on histology and would like to highlight the use of special stains such as the Grocott's Methenamine Silver (GMS) stain as a useful method to assess the presence of tattoo pigment in cases where dense inflammatory infiltrates are present. Follicular unit extraction (FUE) is a surgical procedure, which can be used to transplant follicular units into vitiliginous areas. Such follicular unit transplant has been recently used to repigment stable vitiligo patches. FUE was done for a 12-year-old female with a stable vitiligo patch with leukotrichia on the eyebrow. Repigmentation was noted in 6 weeks and complete pigmentation seen at 12 weeks. Leukotrichia resolved over a period of 6 months. No recurrence was noted at the end of 6 months follow-up with excellent colour match. 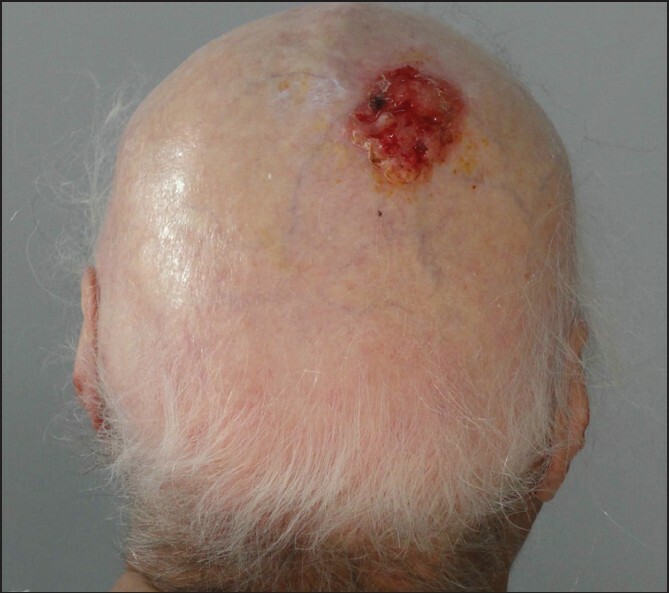 This case is presented to highlight the simplicity, safety and effectiveness of FUE in stable vitiligo patches with leukotrichia. Epithelioid hemangioendothelioma (EHE) is a rare tumour arising from the vascular endothelium of soft-tissue, bone and viscera. Skin involvement is rare. The disease has an indolent course, with the potential for recurrence and often associated with multi-systemic localisations. We present a rare case of cutaneous EHE without systemic involvement in 9-year-old boy. The tumour was completely excised and histopathologic diagnosis was consistent with EHE. Complete systemic assessment showed no internal localisation. Wide excision is the mainstay of therapy and regular follow-up is suggested due to the potential for recurrence. The majority of documented cases of EHE is in adults and has developed in association with an underlying systemic involvement. To the best of our knowledge, this is the second reported case of isolated cutaneous EHE in paediatric age group.